The Nintendo Switch is starting to amass a decent library of third party ports. While it may not be great that we’re getting older titles in lieu of system exclusives, at least the ports have been competent. It shouldn’t come as any surprise that The Elder Scrolls V: Skyrim turned out pretty solid on Switch (it is a six year old game, after all), but weirder things have happened. For starters, if you’re looking to this new port as some kind of reinvention of what Skyrim is, don’t get your hopes up. The Switch features are nice, but this is essentially the same version of Skyrim that launched six years ago. It looks about on par with the PC original, so it is slightly crisper and higher res than the PS3 and Xbox 360 ports, but it also doesn’t push the limits of what the Switch is capable of. You’re looking at a locked 720p/30 FPS while portable and 900p/30 FPS while docked. As such, it might not be the most impressive thing you’ll see the Switch ever push out, but I couldn’t manage to find any slowdown or really damaging glitches in my roughly nine hours of playing. 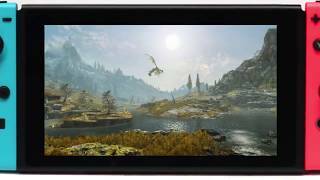 I did have the game crash once and Bethesda hasn’t managed to fix any odd glitches over the years (such as physics bugging out), but performance wise, Skyrim is rock solid on Switch. As you can see from these captures, the textures don’t look that bad, either. As with most of these more realistic looking titles, the game looks quite impressive in handheld mode, but it at least doesn’t come off blurry or low res when docked. This is the full Skyrim experience, just without any of the visual alterations from last year’s Special Edition on PS4 and Xbox One. To make up for the lack of a graphical overhaul, Bethesda has included all of the DLC with this new port alongside some exclusive Switch features. If you’ve always wanted to pretend you’re swinging a sword in Skyrim, now you can. I actually wish it went a bit further (like 1:1 motion tracking), because the idea is so cool. The actual execution is mostly a gimmick. It feels like 2006 era Wii stuff and mostly acts as a novelty more than the preferred control method. At least motion aiming is as spot-on as Nintendo’s own efforts in Breath of the Wild and Splatoon 2. If you’re one of the few that prefers gyroscope controls for precision aiming, Skyrim does a great job of that. What I mainly find so appealing is that everything is optional. If you just do not want any of these Switch-centric features, you can turn them off and never look back. That doesn’t dramatically alter the game, but if you’re a big fan of Nintendo’s classic series, it comes off as a nice homage to the series that practically defined the modern action/adventure genre. I don’t think dressing as Link makes up for the lack of mod support, but at least there is some official acknowledgement from Nintendo that they care about third party developers. Unless you absolutely need to have everything with Zelda related Easter eggs, then this port of Skyrim mostly exists for those with a desire for portability. I find it hard to believe that after six years, people who have wanted to play Skyrim haven’t already done so. At the same time, if you’ve been a Nintendo diehard, maybe this is the perfect opportunity to introduce yourself to a brand new series. The real big factor will be value, as Bethesda is charging the full retail price for this new port. I don’t believe $60 is worth it for such an old game, but if you’ve never managed to get around to the land of Skyrim and really want something for Switch, you could do a lot worse than grabbing this. "One of the best roleplaying games of all time"